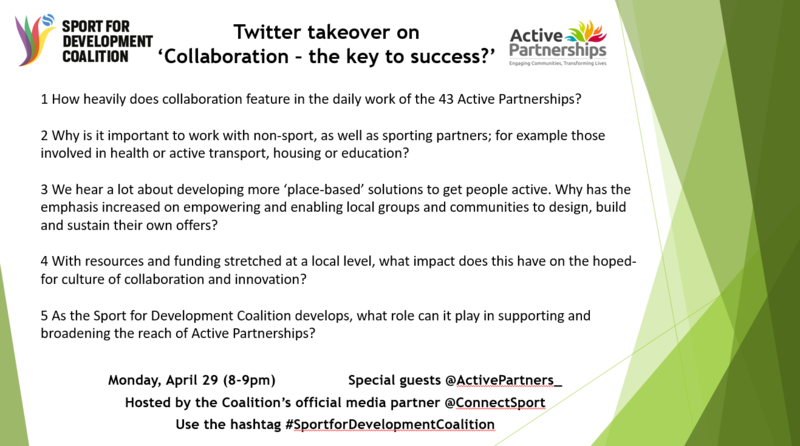 On the last Monday of each month, ConnectSport hosts a live ‘Twitter takeover’ on behalf of the Sport for Development Coalition. The takeover lasts one hour, usually between 8-9pm, and focuses on that particular month’s theme. During the hour, Coalition manager Sarah Mortiboys is joined by a special guest from a leading or ground-breaking organisation involved in the Sport for Development sector. The Coalition poses five pre-set questions on the @ConnectSport Twitter page based on the monthly theme, and the guest tweets their answers. Followers are then invited to join the debate, either providing their own answers to the set questions or adding their own queries directly to the special guest. ConnectSport will share the best responses. Lindsey MacDonald, Director of Strategy and Impact at Street League, on the theme of ‘Employability through sport’. James Mapstone, Founder and Co-Chair of the Alliance of Sport for the Desistance of Crime, on the theme of ‘Sport’s role in reducing crime’. Mark Lawrie, Deputy CEO of StreetGames, on the theme of ‘Building stronger communities through sport and physical activity’. John Herriman, CEO of Greenhouse, on the theme of 'Sport providing a safe place'. NEXT UP: Lee Mason, CEO of Active Partnerships, on 'Collaboration: the key to success?' - Monday, April 29 (8-9pm). - When tweeting your answer, remember to include a reference to which question you are answering, ie for ‘Q2’ use the prefix ‘A2’, and Q3-A3, Q5-A5 etc. - Use the hashtag #SportforDevelopmentCoalition in all of your answers so we can see and share them. - Use specific examples, images and videos in your tweets where possible. - Questions for the takeover are usually published on the ConnectSport website and Twitter feed a week in advance of the takeover, giving you time to consider your responses on the evening. - Please tell us in advance via Twitter if you intend to get involved, and let others know about the takeover by sharing the questions. - We welcome ideas for future monthly themes and nominations for guest organisations. Contact hello@connectsport.co.uk. - Look out for next month’s theme and make sure your organisation responds to our call for articles so we can promote your work. Our thanks to the Sport for Development Coalition for supporting the Twitter takeovers and monthly themes. Find out more about the Coalition here.